In 1995, Nintendo - in an effort to cut costs - did a major revision to their SNES. They consolidated their CPU, PPU1, and PPU2 into 1 Single Chip, known as the "1CHIP", and they also consolidated their Multi-Chip APU (audio processing unit) into 1 Single Chip. Ok, lets discover the differences! Byuu wrote: honestly more of a clone system. There are "drastic" changes. Not so much stuff that's going to affect most games directly, but stuff that tells you the chip is radically different on the inside. Things like the SMP Timer Glitch vanishing, different behaviors of the TEST register, some DSP subtleties, the PPU being entirely different, and mid-scanline effects are totally different which affects games like A.S.P. Air Strike Patrol where the plane's shadow is almost invisible. Its also been reported that some games run slower. Apparently the revised CPU is weaker/slower. Here's what's been found thus far. Again, I have not done any extensive testing. For this to happen, I would have to literally play through the entire library of SNES games. So all I can report is what I've accidentally stumbled across, or what others have found. As of right now, I'm not sure as to "why" these issues occur or if there is a fix for them. Difference #2 - Ghosting - UNLESS your display (and/or scaler, converter, etc) has a sufficient noise filter, then you'll notice that the output of the 1CHIP-Mini has a flaw that results in "shadow ghosting". This means that you'll see faint shadows/noise that extends to the right of objects on screen against bright blue, or bright green, or white or gray backgrounds. Its highly annoying and very noticeable on every 1CHIP-Mini that I've used. The easiest way to spot is with Yoshi's Island. Go to Stage 1-1, and place Yoshi against the bright blue/white sky and jump around. If your display/scaler isn't filtering your signal, then you'll see shadows to the right of Yoshi (the SNES Mini that I tested has 3 shadows extending towards the right of Yoshi). 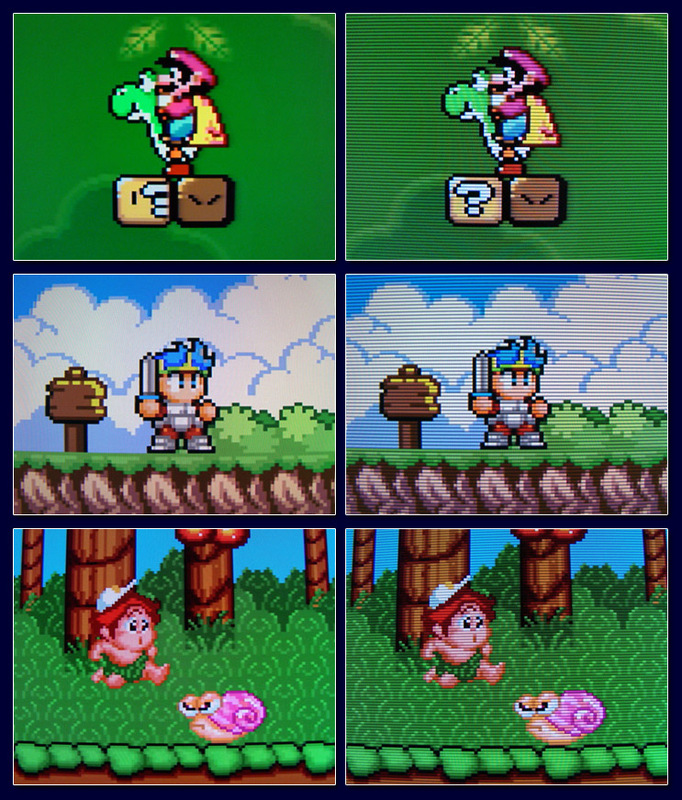 Now vertical bar visibility DOES vary among all SNES consoles. Its not visible on some, while it is on others. But so far, I've been able to see it on every single SNES console I've gotten my hands on (new or old). So the idea that it does not exist "at all" on the Revised SNES is misinformation. I will however say that the 1CHIP-03 (not 01 or 02) has the least visible Vertical Bar out of all SNES's that I've seen. But why do some says it invisible on the Mini? Well, it COULD possibly be that the revised PCB is less noisy. But it could also be the RGB-Modding. For example, when RGB-Modding a SNES Mini, its common bypass the encoder with an amplifier, and this reduces the vertical bar visibility. But guess what? You can do the same thing with the original SNES, and achieve virtually the same results. Difference #4 - Overdriven Whites - The 1CHIP-Mini runs on the hot side in regards to white level. You'll easily notice this right away when comparing it to the original SNES consoles, or other consoles (if just measuring white level). This actually makes some pixels stand out more than others, which can make them appear to be sharper, but it can also be very abrasive as well, depending on the game, display, etc. While you can clearly see the difference right away, some have went through the effort of measuring the output, and found that it does indeed run on the hot side. Difference #5 - Sharper Picture - As many have noticed, the 1CHIP-Mini is sharper than all other SNES revisions. While noone knows exactly why yet, its clear that the picture appears to be, well, clearer. While the reason for the pixel bleeding is currently unknown, its possible that the DAC (Digital-to-Analog Converter) is causing the distortion. It could also be the transistors after PPU2 (or a combination of the DAC and Transistors). I myself use to believe that Nintendo intentionally added mild bleeding for the purpose of blending dithered patterns, but I honestly do not know for sure (Side Note: Sega's Genesis has pretty poor Composite output, which caused massive color bleed. They took advantage of this by using tons of dithering, which would create new colors and fake transparencies. See this link for more info). Nevertheless, the 1CHIP-Mini SNES has picture quality issues also, which are ghosting, overdriven whites, and visual glitches with "some" games. So pick your poison. Anyway, I hope this list helps all who read it. NOTE: Feel free to post new games that you may find issues with on the 1CHIP-Mini. This thread is exactly for that purpose. EDIT: SEVERAL frequent minor edits, corrections, and updates have been made, new games added to list, etc. Last edited by SNES_is_the_Best on Thu Jan 15, 2015 4:59 pm, edited 42 times in total. Re: Which SNES is best? The SHVC-CPU-01? Or the 1CHIP-Mini? ohhh so thats what the DNR setting does on my HDTV! I always turned it off because it added horrible input lag with no visible difference in picture clarity. When it was turned off there seemed to be no noticeable input lag. Good info on all this. Though I use an arcade monitor in a box as my RGB setup and I can't notice any vertical bars when played on the monitor but I can just barely make it out on my XRGB-mini if I get real close to the screen and turn off scan lines. But it is so minor I never would of noticed it if anyone hadn't pointed it out, I have a non 1 chip regular SNES btw. ninjainspandex wrote: ohhh so thats what the DNR setting does on my HDTV! I always turned it off because it added horrible input lag with no visible difference in picture clarity. When it was turned off there seemed to be no noticeable input lag. Good info on all this. Though I use an arcade monitor in a box as my RGB setup and I can't notice any vertical bars when played on the monitor but I can just barely make it out on my XRGB-mini if I get real close to the screen and turn off scan lines. But it is so minor I never would of noticed it if anyone hadn't pointed it out, I have a non 1 chip regular SNES btw. Yep. I'd imagine that the DNR might even reduce the vertical line a little, not sure though, as I've only ran the test with the ghosting issue because the vertical line was not as bad as the ghosting. But still, DNR is virtually useless (for games) cause of the hideous input lag added, which your already well aware of. As you can see, the pic with scanlines turned on is very sharp. Again, this is the launch model SNES, and honestly, I don't see how anyone could look at that pic and claim "that's so blurry!". IMO, that would be simply dishonest. It looks very crisp. As an interesting side note, I've been told by the guy who took that very pic, that the official SNES RGB cable is essentially required for the SHVC-CPU-01. He stated that the original SNES is very sensitive to noise IF each line on the cable is not properly shielded. I can verify that - with the Official SNES RGB-21 cable - each individual line are separately shielded AND grounded (yep, that's right. Red has its own shield, Green has its own shield, and likewise Blue, Sync, and L/R audio). So its probably not wise to use a custom, hand-made, or aftermarket RGB cable in this instance. Last edited by SNES_is_the_Best on Tue Apr 29, 2014 1:43 pm, edited 1 time in total. ah yes I forgot about the shielding on the scart cables, I made the mistake of buying the cheapest scart cable I could find on ebay. But it gave this bad buzzing noise whenever the screen gets very bright. So after that I bought a scart cable from a reputable cable maker on ebay who states her cables are properly shielded, which they were no more buzzing. Though I was able to use that cheap scart cable with my RGB modded N64 and it doesn't have the buzzing issue with it so it worked out. ninjainspandex wrote: I bought a scart cable from a reputable cable maker on ebay who states her cables are properly shielded, which they were no more buzzing. I know who your talking about. Her cables are good. I myself bought one. But compared to the Official SNES Cable, there is a big difference. No multi-coax design unfortunately (ie; each individual wire separately shielded). Hope it works for you regardless. yep her SNES cable is great! I have noticed no issues (aside from the issues that stem from the SNES itself as I stated before) and absolutely no audio buzz at all during bright screens. My worst issue with the SNES Jr. is that the video output appeared to have a very high gain on it. I think this is probably part of what causes the ghosting. The whites were so strong, far too strong. I only tried it with the default composite signal, so I'm not sure if this is a fault with the composite encoder or the raw signal itself. I'm using the original revision SNES, which seems to have relatively poor composite output, but looks fine with s-video. Zing wrote: I'm using the original revision SNES, which seems to have relatively poor composite output, but looks fine with s-video. Yours doesn't have the S-ENC encoder right? The early SHVC has the BA6592F, while the later SHVC has the S-ENC (numbers vary). The composite is noticeably better on the S-ENC (although not huge in some cases). But the S-Video is very close between the two. I have both versions (with and without S-ENC) and I can say you'll be very happy with S-Video, especially if your using the official cable. I find it really odd that you flat out ignore the shadows/bleeding on that image. The top image is obviously Super Mario World on the SNES, and in both pictures, to the right side of Mario and the blocks you can clearly see bleeding/shadows. The middle and bottom images of the MegaDrive and PC Engine games through the same upscaler on the same display clearly don't have that problem. In addition, during your research on this I provided you with both photographs and direct capture images of the 1CHIP-03 model showing no shadows or middle band with and without the Framemeister and DNR always turned off on both TV and Framemeister. But you didn't mention this at all in your post? I'm not knighting for the 1CHIP model, if you like the SHVC better, more power to ya... but don't spread misinformation and say that all units perform one way or another. darcagn wrote: I find it really odd that you flat out ignore the shadows/bleeding on that image. The top image is obviously Super Mario World on the SNES, and in both pictures, to the right side of Mario and the blocks you can clearly see bleeding/shadows. The middle and bottom images of the MegaDrive and PC Engine games through the same upscaler on the same display clearly don't have that problem. I didn't think I needed to mention it. Because that nearly invisible "bleeding" on the right side of pixels that your referring to IS what causes the softer picture. And I've already mentioned in my post about the SNES having a softer picture. Nevertheless, I think you pointed out something that I should have clarified. So for the sake of a misunderstanding, I've revised my statement and mentioned that the smearing is what causes the softer picture. Thanks! After further investigation and testing, I've learned that its impossible to capture the ghosting via "still" pictures, nor can it be captured when the game is paused. Its noise within the output of the console and thus very difficult to capture. Plus, others with a 1CHIP-03 told me that it has ghosting. And guess what? I recently picked up a 1CHIP-03 to finally settle the question, and I can confirm that it has ghosting equal to, or worse than all 1CHIP-Mini's that I've tested. There's nothing magical nor very different about the 1CHIP-03 vs. the 01, the 02, or the Mini. And why should there be? They all use the same CPU, PPU, RAM, APU, etc. Oh, and yes, the 1CHIP-03 has the Vertical Bar. I will however admit that its less pronounced than any other SNES that I've witnessed thus far. None of this is misinformation. I made it very clear that "some" TVs, or scalers will filter out ghosting, heck I frequently refurbish and sell retro consoles/games on eBay and I've tested various SNES's (SHVC, GPM, RGB, APU, 1CHIP, Mini) and the results are the same every time. I'd tried to make it very, crystal clear in my post that some TVs/scalers/etc will filter it.